Atomic layer deposition (ALD) is under active research for its many emerging applications. In the optical field, ALD opens fundamentally new research paths, providing extreme conformality and capacity to engineer new materials. ALD enables coatings which are undoable or difficult through physical vapor deposition (PVD), like films inside tubes, highly repeatable sub-nanometer thick films, double-sided deposition, large-area accurate coatings, and three-dimensional coatings that require extreme conformality. We describe ALD from the practical and manufacturing viewpoint. OCIS codes: 310.1860, 160.1245, 160.4236, 350.4238, 220.4241. Atomic layer deposition (ALD) is often used in nanotechnology and semiconductor applications. In these applications, the films are often thin, and the deposition is done by single wafer or cluster tools. This may be initially unattractive for people searching for optical coating solutions. ALD was invented to solve the industrial problem of producing good ZnS films for thin film electroluminescent (TFEL) displays. In fact, the origins of ALD are found in batch processing for films with thickness over 1 μm, which fits well with industrial optical applications. The production of TFEL displays started in the mid-1980s and is currently operated in Finland by Planar Systems, Inc. Since then, TFEL has been the main ALD user for 25 years. The semiconductor industry found ALD during the 1990s. Intel started ALD production for gate oxides in December of 2007. Now, the state-of-the-art processors, memories, and hard disk drives use ALD. ALD is not directly competing with other coating technologies. ALD is an enabling technology that provides coating and material features which are not possible using other technologies. 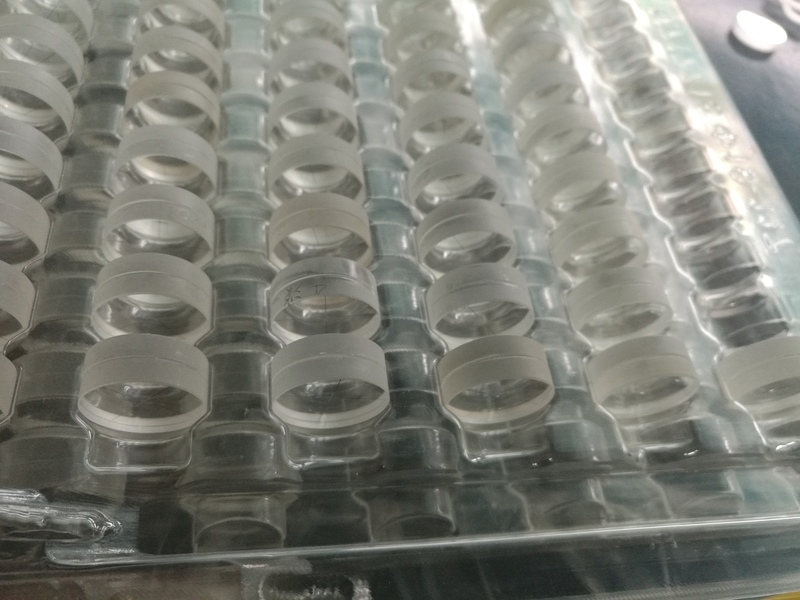 Coatings in batches, large areas, complex three-dimensional (3D) parts, double-sided, new coating materials, and material structures are the main uses of ALD in the optical field. Beyond the semiconductor industry, ALD is not yet very widely used, enabling good patenting possibilities and making unauthorized process duplication difficult. The driving forces for the development of ALD optical applications can be roughly categorized as follows: 1) coating of objects that are difficult or impossible using other methods; 2) engineering of novel optical materials; 3) auxiliary process to provide or improve the crucial features in film stacks; 4) coating by batches and of large areas because the ALD process is highly repeatable. ALD is a chemical vapor deposition (CVD) method using surface reactions. Deposition typically uses two chemicals, called precursors, meeting only at the surface.And it is surface controlled, self-limiting, conformal, and pinhole free. The typical ALD sequence (see Fig. 1) starts as the AlCl3 dose arrives and chemisorbed in molecules on the surface, filling all the surface sites; then the purge phase removes the AlCl3 vapor; subsequently the H2O dose arrives and oxidizes AlCl3, resulting in a solid Al2O3 film and a by-product which is derived in the form of HCl gas. The final purge phase removes both the H2O and HCl vapor. To make more layers, the sequence is repeated with the same or other precursors. The layer by layer implies that the excessive dosing of AlCl3 or H2O does not and cannot increase the deposition rate. This self-limiting feature also provides extreme repeatability. The following are the features of the ALD film growth as follows. 1) Chemisorptions: Precursors make strong chemical bonding. However, the temperature should be high enough to enable reaction between precursors and low enough to prevent precursors decomposition. 2) Saturation: Self-limiting reactions eliminate the need for precise dosing. Small precursor overdosing guarantees that all surface sites are filled. 3) Surface controlled reactions: Deposition reactions on the surface enable extreme conformality into deep trenches and 3D structures. All surface sites need to be exposed for precursors, and this may affect the process design. 4) Sequential: High repeatability and digital-like growth provide high accuracy. Also, sufficient purging is needed between pulses, and good flow dynamics is required to ensure rapid gas changes. For successful atomic layer deposition, certain conditions must concur 1) Pressure is in the range of 0.1?10(hPa, Torr, mbar). 2) Coating temperature with thermal ALD is often in the range from 250 to 400?C. This needs to be taken into account when coating substrates with low thermal expansion. 3) Low-temperature processes (T<100?C) exist for Al2O3, ZnO, ZnO:Al, and TiO2. 4) Typical ALD reactors use nitrogen carrier gas flow (typically 0.2?3 SLM) through the deposition system, and precursors are dosed as pulses in this carrier flow. 5) A very wide range of precursors (often similar as with CVD or metal-organic CVD (MOCVD) is available, and the same film material can often be processed using different chemicals. Using a process in the full saturation regime provides high repeatability, and the growth per cycle is limited to a single molecular layer. Coatings can be less than but never more than what the fully saturated surface allows. In fact, a single ALD cycle does not deposit a full monolayer of a continuous film. Complete surface coverage often needs three to five cycles. The size of precursor molecules and molecules which are eventually left on the surface to form the deposited material is different from the size of the final molecules of the deposited film. Molecules actually block sites on the surface (steric hindrance), preventing full monolayer deposition. Continuous films need 0.4?0.6-nm thicknesses. Typically, the ALD deposition is in an open loop mode, without feedback, hence reducing costs. ALD is a powerful method for material engineering, providing mixtures of thin layers or uniform (co-)doping profiles. The modified TiO2 (see Fig. 2) for optical purposes is a good example of an artificial material demonstrating the use of sub-nanometer layers in ALD. The film is a low-loss, high-index, and nanocrystalline yet optically amorphous-like material. TiO2 has a high refractive index, but in coating temperatures above 150?C, the films become crystalline, causing scattering and optical losses. This can be prevented by keeping the crystal size small enough, which is done by depositing intermediate with less than 1 nm layers of suitable material in the films. ALD films grow on the surfaces as long as precursor molecules can reach the site (see Fig. 3), providing extreme conformality. If the object to be coated includes zones where coating is not wanted, then design features are required to protect those zones. Adhesion of the ALD film is often strong due to the chemical bonds between the surface and the first layer(s) of the growing film. The conformal property of the depo-sition further improves adhesion. The ALD film grows with good adhesion on surfaces, often causing the adhesion issues like silicone, PTFE, rubbers, plastics, and gold. ALD films are dense, resulting in high refractive indexes. The film stress is often low because films grow through chemical reaction, other than thermal energy. To obtain high uniformity, both the coating tool design and precursor chemistry are important. Precursors can decompose or etch the deposited film. Meanwhile, the reaction by-products can reserve downstream sites or etch the growing film. Also, ALD processes have optimum temperature ranges. It must be noted that high repeatability does not mean that the films are uniform. TiO2 (TiCl4+H2O) is an example of a process providing a uniform film in low capacity setups, but its uniformity suffers in high capacity setups. However, there are methods to obtain a high level of uniformity, even with TiO 2 (see Figs. 4 and 5). Generally speaking, uniformity and other issues in ALD have solutions such as changing precursors, adding a third or more chemicals, and changing the way how the surface is exposed for the precursors. The Al2O3 deposited from trimethylaluminum (TMA), Al2(CH3)6, and H2O is in turn an example of a process without much uniformity issues. If the reactor is properly designed, it is difficult not to obtain a reasonably high level of uniformity. Generally speaking, it may be misleading to demonstrate or compare ALD coating tools by referring to the results with Al2O3. Each coating material may have distinct requirements for the tool. It is also important to note that the deposition temperature range depends on the tool design. For example, to the TMA-based Al2O3 deposition, some tools are limited to the precursor decomposition range (<350 ?C), while other tools allow films above 500 ?C. 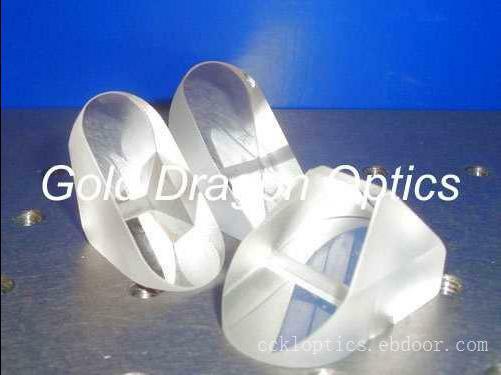 Typical optical materials are Al2O3, ZnO, ZnO; Al, TiO2, SiO2;Al, ZrO2, Ta2O5, ZnS. Typically, ALD produces fully stoichiometric films. Dispersion examples of common optical ALD materials are shown in Figs. 7 and 8. Metals like Al, Ag, and Au is either impossible or impractical, although Al is especially under extensive research in the semiconductor industry. Noble metals can be deposited using ALD, but generally speaking, metals are not appropriate for chemical deposition methods, while physics vapor deposition (PVD) is the better technique. Some fluorides may be possibly deposited via ALD, but the cost and safety issues are limiting these applications. Many carbides and nitrides are easy to deposit with ALD, and they can provide absorptive or conductive films. ALD, in contrast to PVD, and just like all chemical deposition methods, leaves some residues, an impurity from precursors in the deposited film. Actually, several common ALD precursors cause optical losses which are often related to the carbon residue. Typically, however, the impurity content is low and not important for optical properties. But, if the process is close to borderlines, the amount of impurities may increase to noticeable levels. Hence, chlorides are often the safer choice for optical applications than the precursors containing carbon because small Cl and H residues do not typically cause noticeable effects. The general research and development (R&D) work with ALD is typically done for thin films only, and the results of hundreds of film interfaces and thick films are not usually studied. High repeatability and the capability to easily make thin continuous films down to 0.5?1-nm range provide tools for the optical designer to optimize multilayer stack designs and nanoscale materials. The ALD process development for new products takes more time than with PVD due to the slow deposition rates in time and space. The payback comes from the fact that industrial high-capacity ALD batches or largearea coaters are capable of coating many micrometerthick optical stacks having sub-nanometer structures at a competitive cost. The double-sided coating of flat wafers is a standard method with ALD. Thin wafers can be coated easily, and the bending of the wafer (due to stress) is not a problem. The precise coating on both surfaces of a tubular object is a feature not available in other technologies; ALD makes it possible to coat optical filters inside tubes or holes. Nanoscale objects like particles, nanowires, nanotubes, and diffractive structures can be coated conformally with optical films using ALD. Conformal coatings in trenches, for example, to planarize the surface, are used in optical components. Photonic crystals (PC) offer interesting features, and ALD is one of the few technologies capable of making coatings inside 3D structures. It is even possible to create objects consisting of optical materials by first coating the sacrificial mold structure and then etching, burning, or otherwise destroying the mold. Within the display industry, the classical ALD application is thin film electroluminescent (TFEL) display from Planar Systems Inc. Light comes from the Mndoped ZnS phosphor layer. It is the most reliable display available, thanks to the solid state structure enabled by artificial insulators made using Al2O3 and TiO2  . Transparent and/or flexible electronics have active R&D and may have ALD applications in the future. Photovoltaic applications have several active ALD areas related to optics and light in addition to barrier and passivation. Film stacks can enhance reflectivity, and anti-reflective (AR) coatings always have a role. Thin film solar cells have a widening need for functional layers. Important feature of thin film PV applications is the large glass size, as show in Fig. 9. 3D coating capability makes ALD attractive for decorative coatings, although reaching the cost target can be a real challenge. However, product outlook is emerging as a critical feature, facilitating higher costs for decorative processes. Carbides and nitrides have absorptions that make gray shade filters and provide a dark background for decorative coatings. In addition to interference-based decorative coatings, ALD facilitates engineering of mixed materials with certain appearance colors. nSILVER’s R  invisible anti-tarnish film for silver combines optical and barrier requirements. The film reduces the logistic costs (the need to polish silver in shops) of jewelry producers and mints. A large amount of possible ALD dopants is known, rare-earth elements included. ALD offers wide doping possibilities, with full freedom to vary doping profiles and materials during film deposition. For example, erbium doping has been used in a wide range of devices, like thin film wave guide amplifiers and fiber preforms . Also, ALD has been introduced to improve the crack resistance of glass. The capability to suppress cracking resistance is most likely due to the filling Griffith-like flaws by 10?20-nm-thick Al2O3 or SiO2  . 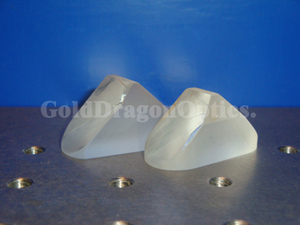 Optical plastic molds can be coated by ALD films to improve surface smoothness. ALD is self-purifying in that the precursor contaminants need to be evaporated and chemically attached on the deposited surface in order to cause trouble. Typically, a 98–99% purityly of the precursor is enough. If the product is developed using expensive ultrapure precursors, it is difficult to reduce purity when production starts. Usually, it is better to start projects with lowpurity precursors. Small single wafer tool results can be dangerously misleading. ALD processes can include uniformity variations due to several reasons. Before making business decisions based on results from small wafers, these results should be first verified, at least in the flow direction, and 300 mm is quite a safe distance. Most processes reach effects when the area of the flow channel is decreased. In practice, a safe process verification needs a batch setup. Research results with certain ALD materials do not mean that they are usable on larger scales. ALD is very repeatable, but the growth requires that the precursors reach the surface. High aspect ratio trenches may need longer exposures and purge times. The flow design of the reactor is important to obtain optimum exposure and to avoid long dosing times and precursor loss. 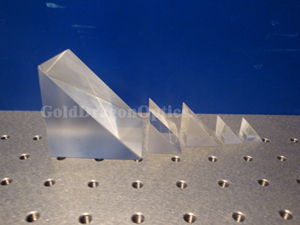 For a flat surface, the cycle times should be below 3?5 s. The fastest full deposition cycle time has been on the range from 0.2 to 0.3 s.
Optical films need small thickness and index tolerances. Although ALD growth is repeatable, it does not mean that the rate is the same on all surfaces consisting of different materials. Especially, crystalline materials tend to cause variations, and usually, the process setup is somewhat an iterative procedure with a few initial thinner filter depositions reaching the deposition rates. The effects are not large, but these need to be taken into account when targeting is less than < ±2 %. The pressure in the ALD process is in the range from 0.1 to 10 (hPa, Torr, mbar). High vacuum is not used due to film growth inside the pump, low gas throughput, and high cost. Batch production entails quite a lot of precursors. The volume of precursor vessels is on the order of liter to liters. Also, the pumping system needs a very good filtering system to prevent pump contamination or film growth inside the pump. Typical ALD reactors use the traveling-wave principle. Nitrogen carrier gas flows through the system, and precursors are dosed as vapor or gas pulses in this carrier flow. The carrier flow takes the precursor pulses as sequential vapor waves through the reaction chamber down to the vacuum pump. Example of such a tool is shown in Fig. 10. The largest preventive maintenance (PM) item is the cleaning of coated construction parts as with any thin film coater. To keep costs down, the construction parts exposed to precursors should either be easily cleaned or easily replaceable. The ALD throughput (coated area/time) is high. The CMOS industry and typical R&D use low-throughput single wafer platforms, and industries other than the semiconductor industry typically use batch coaters. Coatings can be done on both sides of the substrate, or flat substrates can be loaded back-to-back to double the capacity. Both plasma-enhanced and thermal ALD tools exist. Plasma is not easy to apply for the batch mode, and thermal ALD is the preferred method for optical film production. Production applications often need films before (interface, barrier, seed, planarization, adhesion, stress, and etc.) and after (passivation, protection, and etc.) the active layers. The ALD film is naturally pinhole free and provides extremely good barrier properties. ALD coating tools are capable of processing many materials, and typically, it is possible to integrate these pre- and post-coating steps to a single main ALD process. As compared with PVD, this is a benefit as the total processing cost and the production complexity are reduced. Industrial ALD tools often have connections for more than eight precursors. ALD coats surfaces, and the throughput in units of area/time is high. However, ALD is a slow deposition method in time and space, and thus it is often considered only suitable for less 100-nm films with single wafer setups. Optical films are typically thick, often beyond 1 μm, so the batch mode is a logical way to implement production. The thickest film stacks made by ALD have been about 45 μm thick (filter for optical telecom purposes). The deposition rate in the batch or large area mode is typically on the same range as with the small single wafer mode. For example, the ALD cycle time was in the range of 1.5?2.5 s in both cases as shown in Figs. 4 and 6. The ALD throughput is typically in the range of 1?3 μm/24 h (40?130 nm/h), and some processes like SiO2:Al can reach the range over 30 μm/24 h in a traveling wave reactor. Industrial ALD tools are near the 6 sigma reliability level. Typically, there is no need for complex process control instruments. Tools are controlled by the programmable controller (PLC), and the only moving parts are the valves and the pump. ALD may sound scientific and complex, but in practice, it is just the dosing of vapors with purges between doses. However, ALD needs tool construction that takes into account factors like valves dosing millions of cycles, good thermal design, and films growing on all exposed items. Furthermore, the gas flow paths need to be designed well, and good filtering is required before the pump. In contrast to PVD, ALD processes are generally insensitive to small air leaks. The typical carrier gas inside the ALD system is nitrogen. Oxygen, another air gas, is often non-reactive with precursors, and the most harmful air leak item is water vapor. 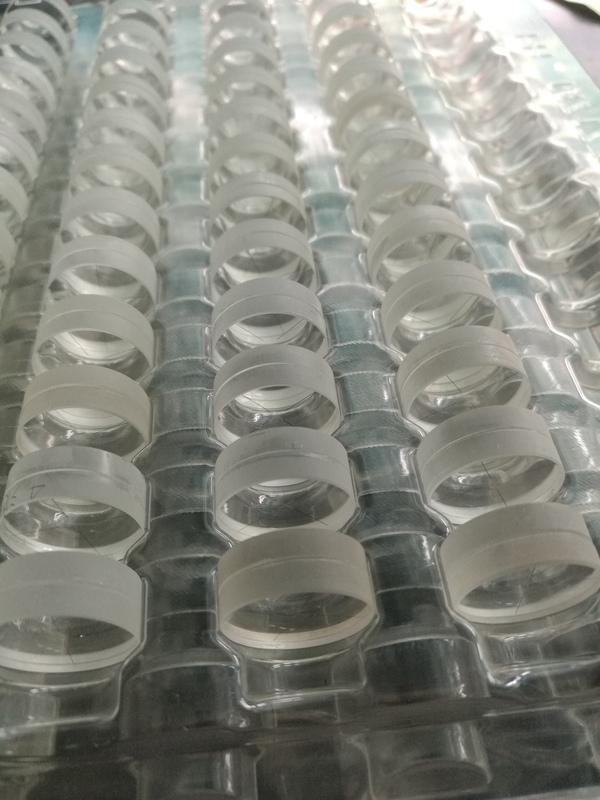 ALD for optical applications generally uses low-cost industrial grade chemicals, and the required direct labor and engineering overheads are low. Batch processing is automated, requiring only an operator during the load/unload moment. Especially with thick optical films, the process utilizes night times, weekends, and holidays, resulting in high annual tool utilization rates. The downtime of a mature ALD system is small, and it is mainly related to precursor refill and the removal of a few parts for cleaning, which use similar methods as PVD, like sandblasting. In most cases, the major part of the coating cost is related to investment payback, and therefore, tool suppliers need to work closely with customers to select or design an optimum ALD system setup to meet the throughput and cost targets for each case. In addition to batch tools, other industrial setups exist like in-line modules and special versions for powder coatings. Roll to roll machines are currently under development for several applications. The ALD coating setup causes some new utility requirements that do not exist with PVD. Pump exhaust lines typically need scrubber systems. Dry pump purge gas consumption can be high (tens of SLM), although the ALD system itself typically uses only a few SLM. However, a dry pump uses low-purity gas, and often, dry air is adequate. Chemicals, including wastes, need attention and may require permits. Glove boxes may be required in filling precursor sources. ALD has been using the batch mode from day zero, but the semiconductor industry still uses single wafer or cluster platforms which do not fit well with ALD. Often, articles related to semiconductor production or R&D are the sources of “ALD is slow” comments. The ALD batch throughput (coating area/time) is high, and speed should be distinguished from throughput. ALD fits very well in high-capacity batches or in large-area production. ALD is a mature thin film coating technology that enables a wide range of new applications. After the semiconductor industry adopted ALD as one of its mainstream technologies, ALD became clearly visible. It is developed and adopted for a large number of industrial applications, ranging from sub-nanometer coatings on particles to large-area coatings for the photovoltaic industry. The best new ALD applications come from people which are not earlier exposed to ALD. In reality, the lack of information on ALD properties—not imagination— has become the main limitation in ALD use. Hopefully, this letter has encouraged readers to look more deeply into this practical method to make highly controllable coatings in the atomic scale.